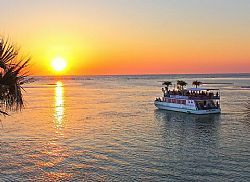 Sea air, stories and sunshine: It’s Time for the Historical Sarasota Bay Cruise! The Historical Society of Sarasota County is hosting its 22nd Historical Cruise and Tour of Sarasota Bay on the LeBarge tour boat on Sunday, November 3, 2013 from 11 am to 1 pm. The cruise will feature narration by popular local historian John McCarthy. Guests can expect a complimentary continental breakfast and a cash bar at noon. Tickets are $40 per person. A VIP pass is available for $50 which provides early boarding and a complimentary beverage from the bar (limited to beer, wine and soda). Fabled local musician Sal Garcia (left) chats with John McCarthy on an earlier cruise. Click for John's 2-minute History of Sarasota... but you'll get the Deluxe Edition on the Cruise! Proceeds benefit preservation projects and community outreach programs at the Historical Society of Sarasota County. Historical Cruise Guests should be at the LeBarge slip, south of Marina Jack in Sarasota’s Bayfront Park by 10:1 5am, rain or shine.